Writer Recharge 2015 is over. And all I have to say about that is... February is just too darn short. Before I give my final update, I want to send out HUGE thanks and hugs to my co-hosts, Katy Upperman, Alison Miller, Liz Parker, and Elodie Nowodazkij. Thanks for joining in again this year and helping make the Recharge a success! And thanks to ALL the Rechargers - whether you participated for one week or all four, thank you. I hope that your month was productive and inspiring. I know that I've been inspired by all of you. 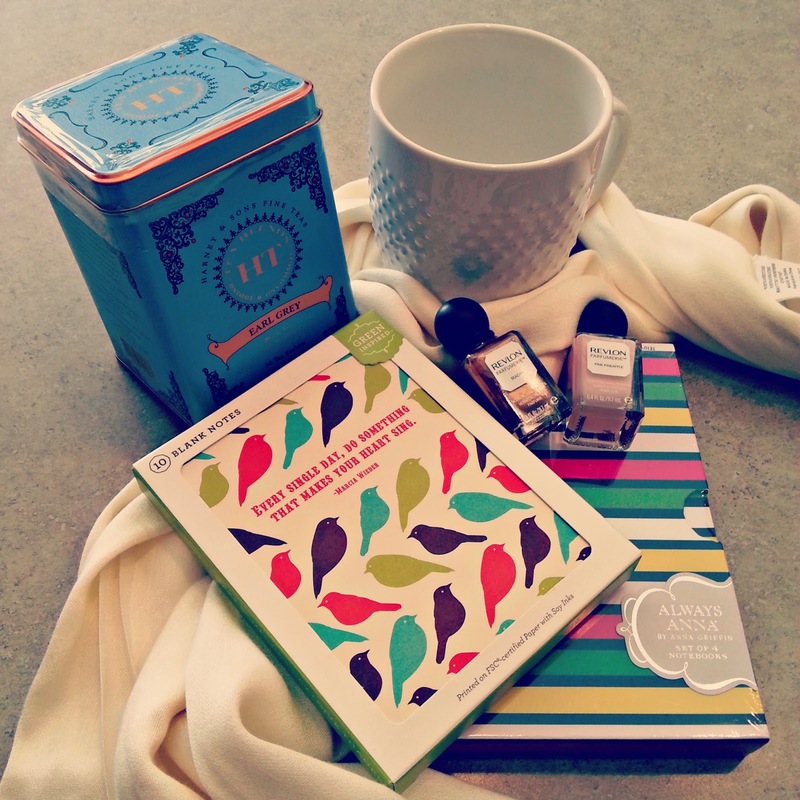 Included is a cream scarf, Earl Grey tea and a cute mug, a four-pack of Always Anna notepads, notecards (with birds! ), and two nail colors: Pink Pineapple and Beachy. The winner will be announced on Friday... stay tuned! And now, for my update. I need to wrap up another revision on the manuscript formerly known as KEYS, and then I can work on a new idea I recently started. My goal is to work on this (working title IF YOU WERE HERE) every day. Yes, I worked on IF YOU WERE HERE almost every day once I completed my revision... this last week I'd hoped to hit 25k, which was a stretch. But then life happened. An out-of-town trip for work, and lots of freelance editing projects, and all kinds of stuff. So I didn't make it to 25k, BUT I do have 16k on a new WIP that I hadn't started before this month. And I'm happy with my progress. Kate Morton is one of my favorite authors. I've devoured everything she's written - with one exception, THE DISTANT HOURS. I've started it twice and for one reason or another, set it aside. My reading goal for Recharge is to finally read this book. Yeah, FAIL. I'm only a couple of chapters in. I didn't get as much reading done this month as I would have liked. This may sound really weird, but I'm going to get a pedicure. I HATE having my feet touched, but my tootsies are in pretty serious winter distress, so I am going to venture WAY outside of my comfort zone and get a pedi. YES, I got a pedicure. And it was okay. I'm proud of myself and the polish on my toes looks fantastic. I am going to start walking again - outside if the weather's nice enough, but otherwise, in the basement. I'm shooting for three times a week. It's a start. FAIL - but this one was a bit out of my control. First of all, the weather totally sucked, and secondly, chronic fatigue has made things a little more difficult than I'd like. I got a lot of rest, which I also need. Twitter writing parties! I hope to party at least three times a week. Watch for them! YES! What's awesome about this? The Twitter writing parties don't have to stop because Recharge is over. I already have a date for the premiere of The Duff. My fun goal for the month is to reread the book before February 20 when I see the movie. Hello, Wesley Rush! YES! I read the book and saw the movie and can't wait to see the movie again. Overall, I'm happy with how the month went. Sometimes life happens, but I appreciate the fact that even though February is behind me, I can continue to work toward my goals in March and beyond. We're looking forward to making the rounds to see how the last week of Recharge went for you. 16K on your new WiP is awesome! :D I'm very excited to hear that you hope to continue doing Twitter writing parties. I know word sprints were ~very~ helpful to me this past couple of weeks. Thank you so much for hosting this again, Sara. It was exactly what I needed to get back into writing regularly again. Seriously, thank you so, so much! I have enjoyed doing this again with you Sara and the other fine ladies participating. You did great! Thank you so much for hosting! I feel like Life getting in the way is the hardest part of writing. Congrats on your new words, and here's to a productive spring! I totally agree that life happens and sometimes we have to accept the progress we made. Better than sitting still! Thanks for hosting and good luck with your writing project. I just started writing again so I'm up for Twitter writing parties! You did amazing on the writing challenge and you hit other goals. That's great. Thanks for hosting this. It was fun. Thank you so much for hosting this challenge! Sounds like you made a LOT of progress toward your goals! And I will have to see THE DUFF! Thanks again for an awesome month of productivity! You did awesome! Congrats! I'm grateful for the support. It definitely pushed me to do more than I normally would.